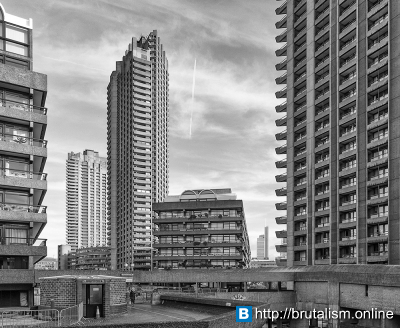 The Barbican Estate is a residential estate built during the 1960s and the 1970s in the City of London, in an area once devastated by World War II bombings and today densely populated by financial institutions. 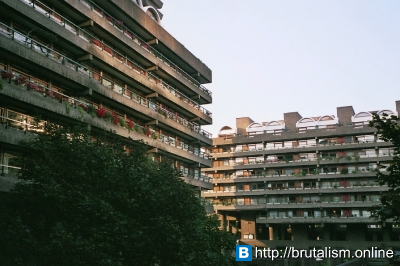 It contains, or is adjacent to, the Barbican Arts Centre, the Museum of London, the Guildhall School of Music and Drama, the Barbican public library, the City of London School for Girls and a YMCA (now closed), forming the Barbican Complex. 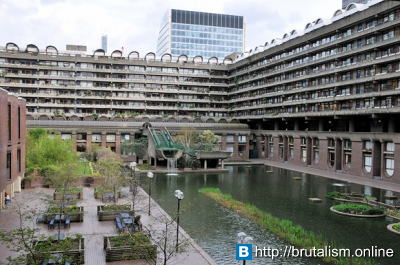 The Barbican Complex is a prominent example of British brutalist architecture and is Grade II listed as a whole with the exception of the late Milton Court. Milton Court once contained a fire station, medical facilities and some flats and was demolished to allow the construction of a new apartment complex which also contains additional facilities for the Guildhall School of Music and Drama. The main fort of Roman London was built between 90 and 120 AD southeast of where the Museum of London now stands at the corner of London Wall and Aldersgate Street. Around 200 AD walls were built around the city that incorporated the old fort, which became a grand entrance known as Cripplegate. The word Barbican comes from the Low Latin word 'Barbecana' which referred to a fortified outpost or gateway, such as an outer defence of a city or castle or any tower situated over a gate or bridge which was used for defence purposes. In this case there seems to have been a Roman specula or watchtower in front of the fort at numbers 33–35 on the north side of the street then called Barbican (now the west end of Beech St), which was later incorporated into the fortifications north of the wall. The Normans called it the Basse-cour or Base Court, synonymous with the modern word "bailey" and still applied to the outer courtyard of Hampton Court Palace. The Base Court continued to serve a military function during the reign of Edward I, but Edward III gave it to Robert d'Ufford, 1st Earl of Suffolk who made it his London home. By the 16th century it had passed to Charles Brandon, 1st Duke of Suffolk. Brandon married his ward Catherine Willoughby, daughter of Maria de Salinas who had been a confidante and lady-in-waiting of Catherine of Aragon and after his death was retained by the Willoughby family. The original Base court seems to have been destroyed and the large building that replaced it was called Willoughby House, a name revived for part of the modern development. During World War II, the City suffered serious damage and loss of life. The Cripplegate ward was virtually demolished and by 1951 the resident population of the City stood at 5,324 of whom 48 lived in Cripplegate. Discussions began in 1952 about the future of the site, and the decision to build new residential properties was taken by the Court of Common Council on 19 September 1957. The estate was built between 1965 and 1976, on a 35-acre (14 ha) site that had been bombed in World War II. The complex was designed by architects Chamberlin, Powell and Bon, whose first work was the ground-breaking Golden Lane Estate immediately north of the Barbican. The estate of 40 acres (16 ha) was officially opened in 1969 and is now home to around 4,000 people living in 2,014 flats. The flats reflect the widespread use in Britain in the 1960s and 1970s of concrete as the visible face of the building. 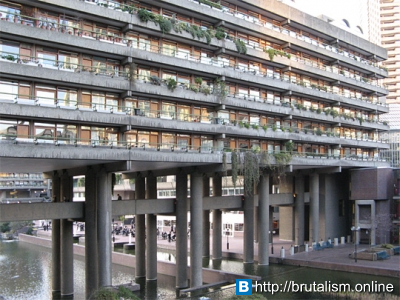 The Minister for the Arts, Tessa Blackstone, announced in September 2001 that the Barbican complex was to be Grade II listed. It has been designated a site of special architectural interest for its scale, its cohesion and the ambition of the project. 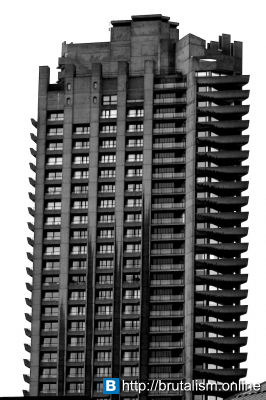 The complex is architecturally important as it is one of London's principal examples of concrete brutalist architecture and considered a landmark. The residential estate consists of three tower blocks, 13 terrace blocks, two mews and The Postern, Wallside and Milton Court. These are grouped around a lake and green squares. The main buildings rise up to seven floors above a podium level, which links all the facilities in the Barbican, providing a pedestrian route above street level. Some maisonettes are built into the podium structure. There is no vehicular access within the estate, but there are some car parks at the periphery of the estate. Public car parks are located within the Barbican Centre. Lauderdale Tower, completed in 1974 – named after the Earl of Lauderdale. Once the tallest residential towers in London, they were surpassed by the Pan Peninsula development on the Isle of Dogs. 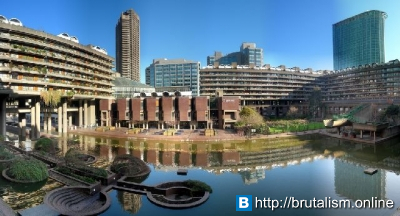 The Barbican Estate also contains the Barbican Centre (an arts, drama and business venue), the Barbican public library, the City of London School for Girls, the Museum of London, and the Guildhall School of Music and Drama. A YMCA building was constructed between 1965 and 1971 to link the Barbican and Golden Lane Estate; it is also listed.